The Independent National Electoral Commission, INEC, has reacted to the decision of the Governor of Imo State, Rochas Okorocha to drag it to court. 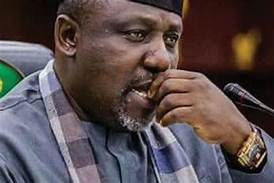 Following INEC’s refusal to issue him a Certificate of Return after being declared winner of Imo West senatorial election, Governor Okorocha on Thursday took a legal action against the commission. Speaking in an interview with newsmen after the briefing on fate of federal lawmakers yet to be issued Certificate of Return in spite of being declared as winners of the elections, Festus Okoye, INEC’s National Commissioner, Information and Voter Education, said since Okorocha and others have taken legal action, the commission will allow the judiciary to decide. He said that there were four lawmakers in that category, whom INEC refused to issue Certificates because their results were declared under duress. He added, “Since they have taken legal option we are going to allow the judiciary to take it course. “At the end of the day we will comply with whatever the court says,” he said. *Chei everyone is suing INEC!! !......Is it me or has Gov Rochas lost his hold in Imo state and the Villa? Okorocha is fighting a lost battle. I doubt if he will win his case. The court won't grant him victory on such matter if the respondent (INEC) prove their point very well. Anon 09:13 pls stfu and go study your electoral rules and constitution. You people will not read to know, all you do is whip up sentiments and display your ignorance online. It's like taking someone a hostage with a put pointing to his head to make some pronouncement against his will. And you expect the person who made such pronouncement against his will to do exactly what he said after he was being released and free? That act alone should be punishable by law. Since the he has decided to go to court, let the court now expose his criminality. INEC speaking from both side of their mouth. Truth be told, Rochas is right on this one. He is being witch hunt by APC. And INEC allowed themselve to be used. Such a pity. We don't want Rochas representing us for anything at all!!! His result was declared under duress which invalidates his victory. They will have to conduct another election. Besides, I don't think the leadership of APC want to completely withhold the certificate. They just want to keep him busy till a Senate President is elected, so that he does not pull a Saraki on them. After all he did to Chief Oyegun- the then APC chairman. He was instrumental in bringing in Oshiomole and that one is now a thorn in his flesh. Oshiomole and Tinubu are next. Macbeth has murdered sleep, he can't sleep. @Chei everyone is suing INEC!! !......Is it me or has Gov Rochas lost his hold in Imo state and the Villa?